For Alexandra “Alex” Sickinger (Oglesby), baseball runs in the family. The daughter of a San Francisco Giants minor league prospect, Alex grew up in Pacifica with glove, ball and bat always close at hand. Natural talent, a relentless work ethic and love for the game have taken her from the sandlot to the top of her sport as a professional women’s baseball player. An All- League varsity player on the boys team at Oceana High School, Alex was drafted upon graduation as the youngest player on the field when the Ladies Professional Baseball League began play in 1997. At age 17 she proceeded to lead the San Jose Spitfires to the league’s first World Series Championship, winning Rookie of the Year and Defensive Player of the Year honors along the way. 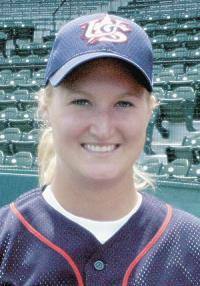 In 2002, Sickinger helped form the California Women’s Baseball League and was MVP twice. 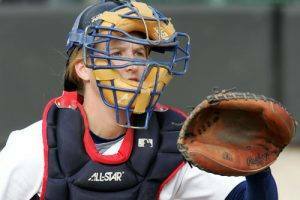 She continued to win honors with the 2003 US National team in the Women’s World Series of Baseball and with the 2004 team, which won the Gold Medal at the Women’s World Cup of Baseball in Canada. Now married to Santa Rosa native and ex-minor league baseball player, Travis Oglesby with two young boys, Alex now devotes her time to expanding a girl’s baseball program, the 13U Bay Sox, which she helped develop with the San Francisco Recreation and Parks Department. Join us on October 12th to meet this extraordinary young woman and hear more about her ground breaking career. * Many thanks to Ray Giampaoli and Debi Zaft. Dan Schell for room set-up and take down. Dan Shell said, “Sit down, this will take a while”. Dan then recited the Dr. Suess story about Sarah Cynthia Sylvia Stout, the girl who would not take the garbage out. Dan has an incredible memory for rhymes and a keen sense of humor! 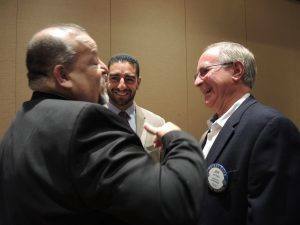 Paul Hamilton introduced our visiting Rotarian, Robert Hirsch. Bart Eddy introduced Gene Tucker of Tucker Associates. There were $22 Yankee dollars in today’s raffle. #0657 was Roy Thylin’s winning ticket, but he drew the wrong marble and only collected the $10 consolation prize. El Presidente Jose shared the following announcements. * El Presidente reminded us to put spare change into the polio bucket. Our club goal is $2,000 this year. We’re currently have around $350. * Reminder to buy your tickets for the Foundation Dinner –South and celebrate 100th It will be held on Saturday, October 15th at the Flamingo Hotel. * Jack Geary has requested someone else to assume the Sergeant at Arms position. This is a critical position in our club and we need a volunteer to oversee these functions. This is an officer position and it covers your lunch as a stipend. If you are interested, please let me or Debi know. In the meantime, many thanks for those continuing to help out every week. * Our Club’s Annual Meeting will be held Dec. 7th At this meeting, the slate of officers and board directors will be voted on. * Gran Fondo Volunteers were thanked for another awesome event. Doug and Carmen did a great job in coordinating a very busy and but enjoyable rest stop. * Andrea and everyone who attended last week’s Inter Club Social at The Living Room were thanked. * Ryan Kitchens-Last year’s NewGen graduate was accepted at the National University of Australia, pursuing International Relations studies. As a result of his NewGen experience, he has reached out to Patricia Shafer from NewGen Peacebuilding Program to help bring NewGen to Australia. We are proud to see NewGen students continuing to spread the message of peace building. * Layne Bowen invited members of our club to his house on Sunday,October 23rd for an “unofficial” Rotary social. The event is a backyard concert featuring the Michael Capella Band of which Layne is a member. Michael was one of the songwriters featured at a recent Rotary meeting. There is no admission charge and you don’t need to bring anything. Snack foods and drinks (beer, wine, sodas, etc….) will be provided. Donations to help with refreshments and to tip the band will be gladly accepted. Come join the fun! The event runs from 1-4pm and there is plenty of parking. Please rsvp to Layne as we have room for about 75 people. (In the event of rain, the event will be postponed to a later date). * Diane Moresi reminded everyone of her meat auction / barbecue social Thursday, October 6th. Bring your money and be ready to bid for some quality, locally raised meat products. * Ray Giampaoli announced that he will be collecting gently used luggage at our next Rotary meeting for donation to Valley of the Moon Children’s Home. If you have old luggage taking up space in your house, bring to the next meeting and Ray will make sure it’s put to good use! Mikki Cardoza, who we haven’t seen for a while was recognized for her Best of Humboldt for MikkiMoves Real Estate and her return to our club. She was $300 worth of happy. 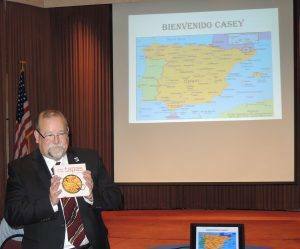 Casey de Angelo got to practice his Español in Spain for the last few weeks. 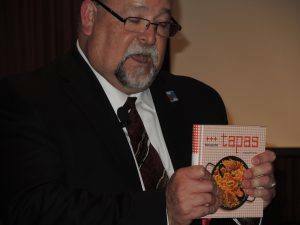 He returned with a tapas cook book to be auctioned off by El Presidente. Casey also donated $50 to the club and $50 to the foundation. YMCA Garden – Pete Lescure was recognized for his hard work. He donated a total of $100 to the foundation and club. Kim Graves was recognized for her recent trip to Savannah, Charleston and Hilton Head. She returned with some Savannah candy for El Presidente. * Jeff Kolin stood up and announced his recent trip to Pleasanton to witness the birth of his grandchild. He followed that announcement with a generous donation to the club. 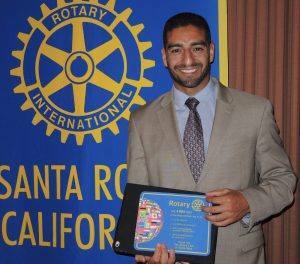 * Ted Wilmsen recently attended a meeting at the first Rotary Club to accept women in Southern California. Ted bought 8 squares and donated to $50 to the club. * Fred Levin is still selling tickets to the Veterans program. Buy a ticket for yourself – buy one for a Veteran! 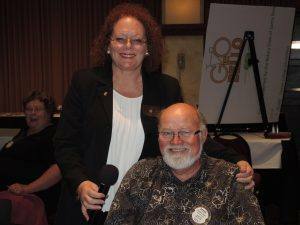 Secretary Debbi Zaft with Steve Olsen after he nails the Rotarian magazine quiz – once again! Efren Carrillo shared his thoughts on the current and future county board of supervisors. Mr Carrillo discussed Preservation Ranch /Buckeye Forest, the Jenner Headlands open space acquisition and its development as public access open space. He also discussed acquisition and development of the Estero Americana. 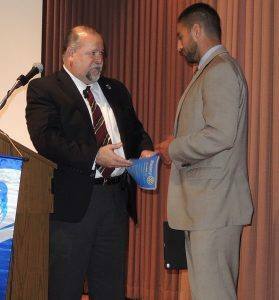 Mr. Carrillo gave us updates regarding the Sonoma County water agency and Sonoma Clean Power. With Sonoma Green Power, the debts are paid and consumer energy prices are lower while renewable energy is being developed. He also discussed challenges and opportunities regarding cannabis as well as the diverse interests of a District that runs from Roseland to Sea Ranch and includes the coastal and Russians River communities. Mr. Carrillo covered a number of other challenges that must be addressed by the county board moving forward including: Roseland redevelopment, road maintenance and other transportation issues, early education, and pensions. were apparently not authorized for publication anywhere in the world and cannot ever be repeated by anyone anywhere without risk of lawsuits, slow torture or sudden painful death by firing squad!